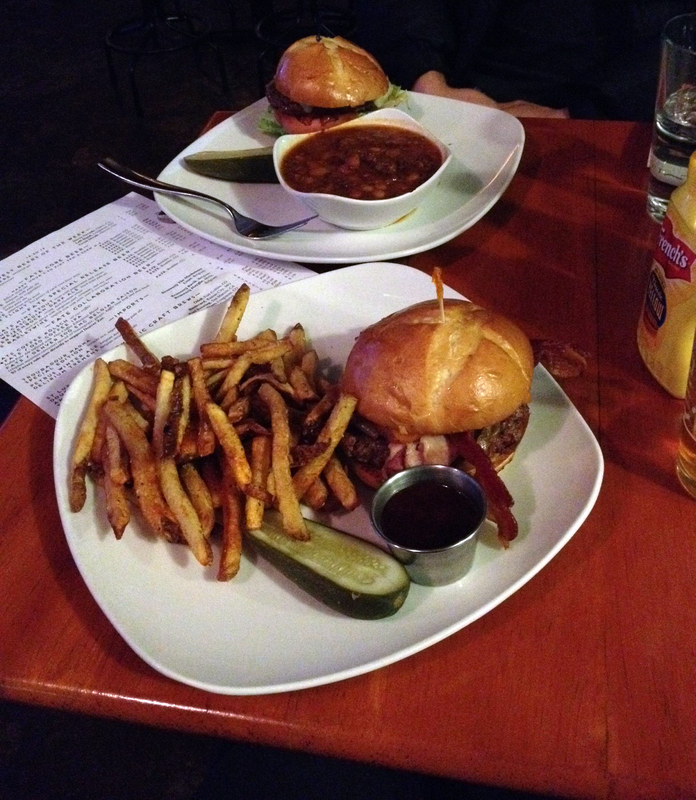 When I go out with Gabe, we need three things: we need a noisy pub, we need beer, and we need burgers. Decent ambiance and tasty sides never amiss either. Fate has these in spades: one of the newest breweries in Boulder’s lively scene, it has a lot to answer to in all these areas. With seventeen breweries in the county alone, we are never at a loss for good craft beer. With breweries, brew pubs, pubs and bars on every corner, two guys going out for a beer and bite also have their selection of atmospheres, from dingy to understated to high-class. Fate might fall in the last category, but it’s not a bad thing: imagine Mountain Sun with a little less hippy, a little more east coast, and a dash of local coffee shop art on the walls. Crucially, though, they’ve got the third element: burgers. From the elegance of the Mainstay (on par pricewise with burgers elsewhere, despite Fate’s generally higher prices) to the double-pig decadence of the Pit Boss and the beef-bison-lamb-chutney balance of the Trifecta, you’ve got options–and that’s not getting into the dozers, the cubans and the clubs, when you’re not feeling like a patty. Tonight we are. I go classic, ordering the Mainstay to see what Fate’s got for meat and bones. Gabe goes for the Pit Boss, the one we’re all actually salivating over, with smoked cheddar, spiced-honey glazed bacon, house-smoked ham, carmelized onions and Fate’s own BBQ over a thick patty. That’s a burger you can sink your teeth into, something to compete with the Silo burger at Oscar Blues. Meantime, we order some beers and a starter of sticky ribs, because hoisin BBQ sauce sounds too good to ignore. The beers come, the Fate Moirai for Gabe because he loves hops, the seasonal Chocolate Mint Stout for me, because I want to see if they can pull off both chocolate and mint in one of my favorite beers without making me feel like I’m drinking flavored coffee. They do: the stout is rich and mellow up front, just chocolatey enough to make me think beans, not candy bars, then it’s rolling off the back end with a hint of peppermint as the bitters come out, playing off each other nicely. Gabe’s loving the Moirai: lots of spice notes, hoppy and full-flavored without requiring IPA-allegiance the way an FYIPA might, it’s right up his alley, and a sometimes-hopper like myself can dig it too. He orders a couple more as the night progresses. The third elements: Fate's Pit Boss in the front, the Mainstay and beans behind. But here’s the kicker, here’s the star of the show: the Sticky Ribs. You remember that really good rack of ribs you had, that one time? The just-right balance of smoke, tang, and rub, the way the meat dropped off the bone before you had it all the way in? And remember how you were like, ‘These are the Ribs of Destiny. Nevermore shall I ache for the ultimate rib’? Prepare to do it again. Fate’s Sticky Ribs are not your grandpa’s secret recipe (a dash of curry! ), not the Ribs of Destiny you had in a roadhouse on a college bender through Louisiana–these are something new. Start with hoisin in your sauce, giving it that Asian hint of ginger and plum, stacked on the sour tang we need to balance the sweet and the smoke. Continue on to house-smoked meat flaking off the bone, just the right color to the flesh, bones pulling clean in your hand. Now dash some sesame and green onion on top to set off the savory with front end bite. And the slaw they mention in the description? Try kimchi, that evil Korean twin–fiery, sour, fermented just soft enough, just crunchy enough, with enough chilies that you keep going back and forth between the meat and side like you don’t know which one’s answering the other. Because they both are. These ribs-done-eastern left us questioning our cultural heritage, whether there IS that one, ideal, Rack of Destiny. There might just be two. And now the burgers: Gabe’s on his second Moirai, I’m trying to keep my head straight to write this, and the waiter’s dropping two heavy plates full of burgers, fries, and baked beans. The beans are worth a side note–these are no reheated Hormel. They have the firmess and moisture of a truly home-baked legume, with pulled pork stewing in a full-flavored, bbq-inspired sauce that doesn’t need sugar and cornstarch to make up for taste. They’re lovely. So are the burgers: for a slice of white cheddar, some greens and a tomato, my Mainstay is a legit burger. They don’t skimp on the patty size, the bun is toasted, the pickle is big enough to hurt someone with, and the fries are good too, crispy and potatoey with a hint of paprika. But the real star is Gabe’s Pit Boss: bacon and ham are dropping off this thing like the mistress you didn’t want your bovine mainstay to know about, but had to have anyway, oozing that house-made sauce, challenging you to get it all in a single bite, soaking up beer and work-week stress like an all-night bender in a bun. It’s delicious, cooked just right. My Mainstay is actually a little underdone–I ordered medium rare and got mostly pink with a char around the edge, but I’m too into the food, ambiance and guy talk at this point to cause a scene about it. And that’s the point: you get some good food, you get some great beers, you unwind somewhere nobody can tell you you’re not king. And if you’re lucky, you meet a pair of ribs that makes you question everything you knew about delicious. That’s what me and Gabe do, nailing the trifecta of noisy pub, crafty beers and great food that we love so much. We stay long after the food’s gone, enjoying Fate’s mellow mood and finishing up our drinks. I don’t know if it had something to do with the place’s name, but with the three elements of ambiance, beer and burger in place, it seemed inevitable we were going to have a good time. Thank you, Fate. No having tried any of the foods you guys did, I’m intrigued; sounds really tasty. How do the happy hour specials compare to other brew pubs, like Bru? Thanks!